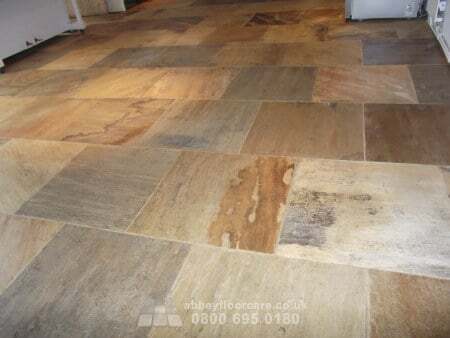 Indian sandstone is a favourite stone for flooring. The mixture of earth colours makes for an exciting and colourful floor. However, soil and dirt hide the colours leaving a dull soiled appearance. 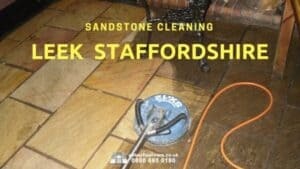 This Indian sandstone cleaning sealing Duffield project was in an old farmhouse kitchen and dining area. The floor suffered from a lot of tracked-in soil off the cobbled courtyard from pets and children. 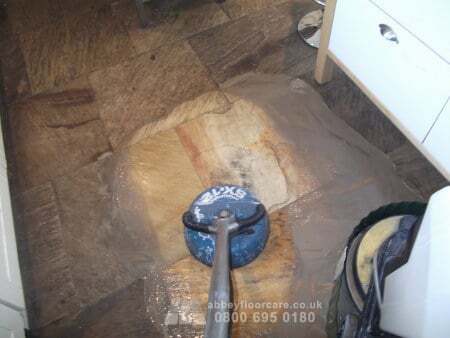 The homeowner searched online for advice on Indian Sandstone cleaning sealing and came across our website. 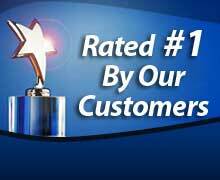 We discussed the options for cleaning and sealing, and I assured the client that I could clean the floor to an as-new condition. 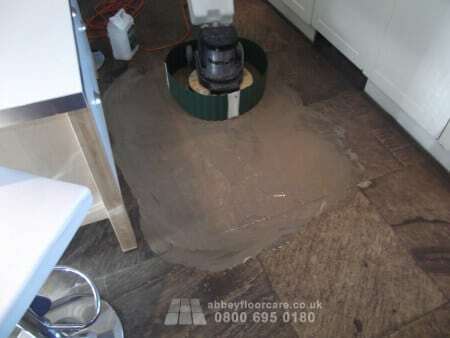 The client had difficulty mopping the floor because the mop dragged on the rough sandy surface. She wanted the restored sandstone to be more comfortable to clean if possible. I advised that an acrylic surface sealer will help because it sits on the surface of the tiles, making the finish smoother and easier to maintain. 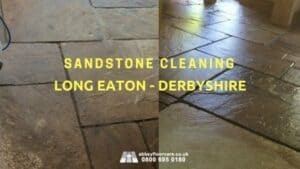 I started the sandstone restoration work using our Heavy Duty Indian Sandstone Cleaning Solution. The cleaner was allowed to sit on the floor for around 20 minutes so it could soak into the surface of the tiles. A rotary scrubbing machine scrubbed the chemical into the stone, lifting the soils away from the sandstone tiles. Finally, I used pressurised water rinse and capture equipment to remove the slurry and embedded soils from the stone. Indian sandstone is a porous stone, so I applied a coat of impregnating sealer to as a primer for the Surface Sealer. Finally, I applied four coats of Mid-Sheen Acrylic Surface Sealer. The client was so happy with her floor. She particularly appreciated the range of colours in the stone and how the finish was more comfortable to mop and clean. 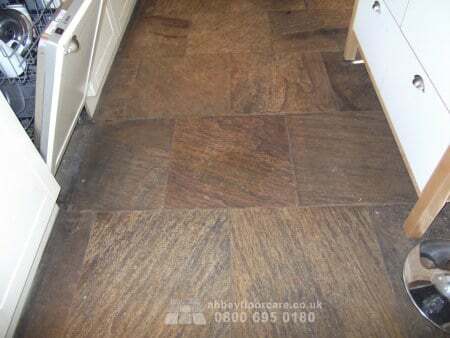 If your Indian Sandstone floor is dull and difficult to clean. 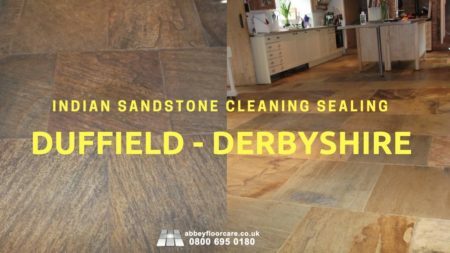 Click here for a free, no-obligation quotation to restore your floor to a beautiful, easy to clean finish.